This weekend President Donald Trump and Secretary of State Mike Pompeo as the U.S. bluntly warned the Iranian regime against any further transgressions against the U.S. It started with Pompeo addressing a gathering of Iranian-American leaders at the Ronald Reagan Presidential Library in which he launched a blistering attack aimed at Iran’s religious and military leaders; likening them to the Mafia. Pompeo’s hardline speech comes just three weeks before the first round of banking sanctions suspended under the Iran nuclear deal is re-imposed after President Trump withdrew from the landmark agreement in May. Bigger sanctions coming in November are aimed at cutting off virtually all Iran’s oil market, according to the Washington Post. 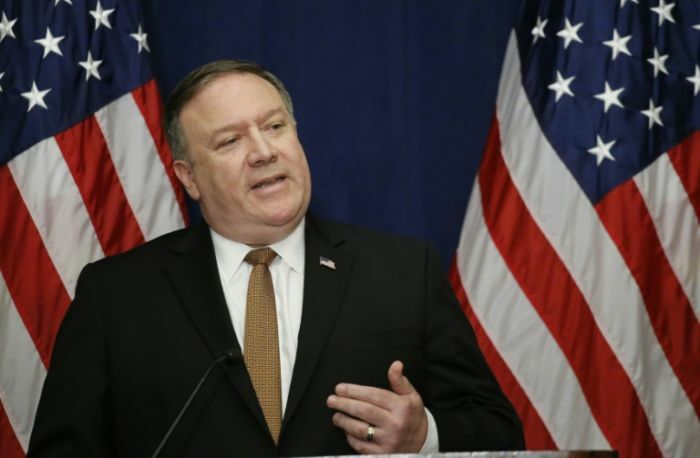 Pompeo’s speech delved deeper into U.S. demands that the Iranian regime stop repressing dissidents and religious minorities, as well as halt its support of militant and terrorist groups throughout the Middle East. Pompeo’s speech fully realizes the administration’s growing strategy for Iran in which it will make its appeals directly to the Iranian people to propel peaceful, democratic regime change; a policy long advocated by Iranian dissidents, including the National Council of Resistance of Iran. Pompeo’s speech focused on the rampant corruption within the regime’s leadership which has been the target of mass protests by Iranians across the country since last December. He attacked what he called Iranian regime’s “hypocritical holy men,” saying the ruling elites have enriched themselves through corruption and called out officials by name who he said had plundered government coffers through embezzlement or by winning lucrative contracts. He singled out “the billionaire general,” Interior Minister Sadegh Mahsouli; Grand Ayatollah Makarem Shirazi, the “Sultan of Sugar”; and Sadeq Ardeshir Larijani, the head of Iran’s judiciary, whom he said had embezzled $300 million in public money. He also attacked Ayatollah Ali Khamenei for presiding over a $95 billion “sludge fund” for the Revolutionary Guard Corps. In delivering this speech Pompeo finally closed the loopholes created by the Obama administration during negotiations on a nuclear deal which let the Iranian regime off the hook for human rights abuses, development of ballistic missiles and sponsorship of militias and terrorist groups in waging proxy wars in Syria, Iraq and Yemen. Following on Pompeo’s speech, the president himself took to Twitter in response to a speech by Iranian president Hassan Rouhani who warned that the U.S. risked the “mother of all wars” in a conflict with Iran. Rouhani warned against threatening the nation’s oil exports and called for improved relations with its neighbors, including arch-rival Saudi Arabia in what can only be considered a sign of the weakness of the regime in offering an opening to its rival. The president left little doubt of his intentions in the face of Rouhani’s threat and reminded the Iranian regime that even a blustering speech for domestic political consumption was going to have potentially disastrous consequences for the regime. Long gone are the days of kowtowing to the regime under the Obama administration where every aggressive act against the U.S. from launching ballistic missiles that could strikes U.S. bases to the funneling to explosives and arms to terrorist groups that killed U.S. service personnel to even taking U.S. sailors hostage was going to be tolerated anymore. Rouhani and his overlord, Ali Khamenei, find themselves in a pickle as President Trump prepares to re-impose sanctions on Iran’s oil industry as its economy already is reeling from gross mismanagement. A key point for halting Iranian oil exports is through the Strait of Hormuz. Rouhani’s claims were undercut by threats by regime officials to cut off commerce through Hormuz. Iran would halt oil shipments through the strait if the U.S. stopped it from exporting, Esmail Kowsari, deputy commander of the Sarollah Revolutionary Guards base in Tehran, said earlier this month, according to the Young Journalists Club, which is affiliated with Iran’s national broadcaster. But then again lying seems to be a perquisite for being part of the Iranian regime.